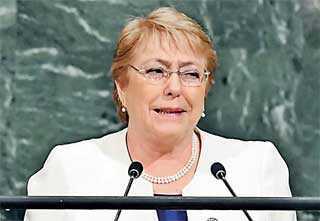 UN High Commissioner for Human Rights Michelle Bachelet during a meeting with Foreign Minister Tilak Marapana has assured of continued support for Sri Lanka’s reconciliation process and the full implementation of the resolution agreed to in 2015. Foreign Minister Tilak Marapana and delegation met with High Commissioner Bachelet and UN Office Under-Secretary General Michael Moller this week, on the sidelines of the 40th Session of the Human Rights Council in Geneva. The delegation comprising Dr. Sarath Amunugama, Northern Province Governor Dr. Suren Raghavan, and Ministry of Foreign Affairs Secretary Ravinatha Aryasinha and UN Permanent Representative of Sri Lanka Ambassador A.L.A. Azeez had a frank and candid discussion with the High Commissioner for Human Rights, during which perspectives on different aspects of OHCHR’s engagement with Sri Lanka were shared by the delegation, a statement by the Foreign Ministry said. Regarding certain information contained in the Office of the High Commissioner’s Report such as the ‘mass graves’ in Mannar, the release of lands held by the military in the North and East and other matters, the Sri Lanka delegation emphasised the importance in compiling these reports by engaging closely with the relevant local institutions and independent bodies, including the National Human Rights Commission, in verifying facts on the ground. At the meeting with the UN Under-Secretary General on 21 March, the Foreign Minister briefed Moller on progress achieved by Sri Lanka in reconciliation, peace building and development and emphasised the importance of continuing assistance by UN agencies in ongoing reconstruction, reintegration and sustainable development efforts. The Foreign Secretary and the Permanent Representative were associated with the Minister. Responding to Sri Lanka’s initiative on the National Tripitaka Week and the importance of Tripitaka as a UNESCO heritage, Under-Secretary General Moller assured the delegation that the UN Office in Geneva would extend support for holding specific activities such as library talks on traditions and cultures highlighting their significance as common heritage.